Sometimes a pair of jeans and a set of messy fingers is exactly what you’ve been needing after a long day. As any foodie could tell you, California is blessed with a vast array of incredible gourmet eateries. In one day, you could theoretically enjoy mimosas for brunch, authentic Spanish tapas for a midday snack, then indulge on unsurpassed surf and turf for dinner. But somewhere between all the fine wining and dining, it’s nice to switch it up with a no-fuss burger and beer kind of meal. In Southern California, there’s definitely not a shortage of places that supply a great burger; the problem isn’t finding what’s good, it’s about finding what’s best. 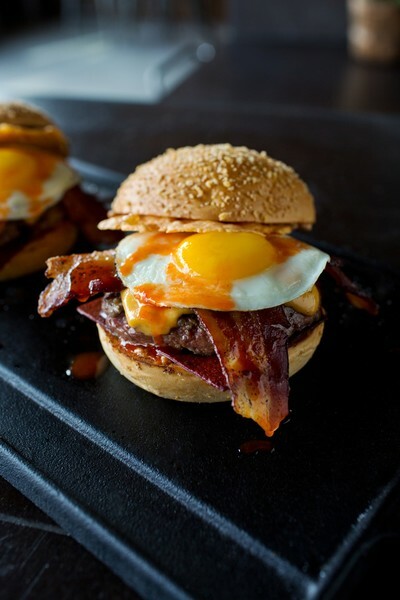 So where can you find an eatery that takes their burger game to the next level? Whether you’re looking for something extra-juicy, stacked a mile high, or totally unique, these twelve restaurants have what it takes to make it onto your burger bucket-list. Switch up your brunch with a burger that brings the taste of Italy to the table. In Downtown’s City Market South is Rossoblu, a restaurant that offers the best of Bologna and Los Angeles. If you’re ever in the mood for brunching alfresco, try getting your hands on the delightfully saucy Bolo Burger. 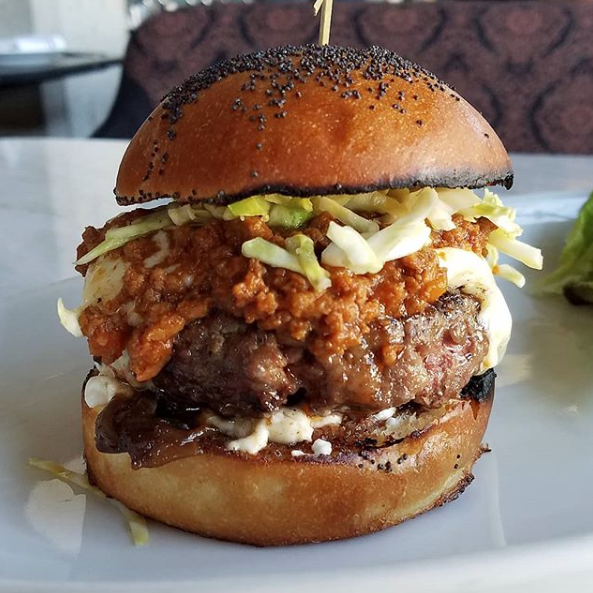 Rossoblu takes a milk bun, stuffs it with an all-beef patty that’s topped with fontina cheese and cabbage slaw then smothered with their famously delicious ragu bolognese. Anyone who has been to Seal Beach can attest to its small town, endless summer sort of charm. But after sunset is when the pub crawl begins. 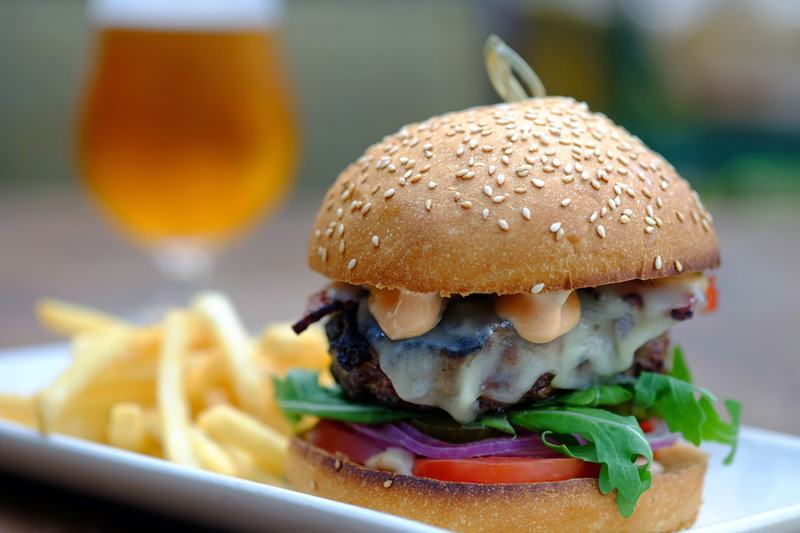 Start your night out at The Abbey, Seal Beach’s best-kept burger secret. 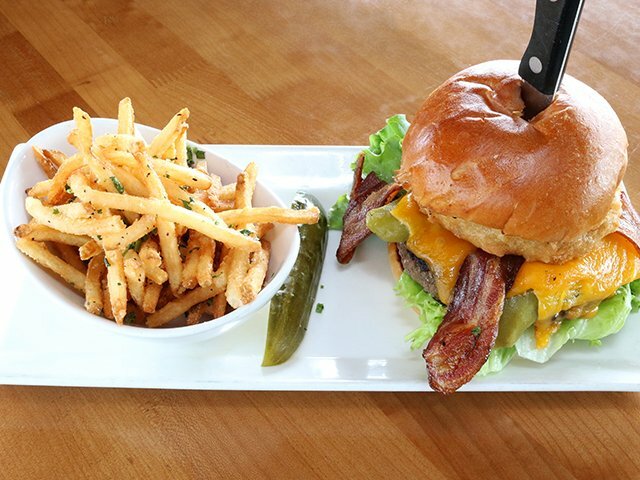 Even though they’re known for their wood-fired ovens and their selection of German beers, the menu item that really jumps off the page is The West Coast Burger. They take a thick and perfectly-cooked all-beef patty, top it with lettuce, tomato, bacon, cheddar, and onion rings, douse it in a rhubarb chipotle BBQ sauce, then give it a squeeze between a poppy seed bun that’s dressed with an herb mayo. If you’re in the mood for innovation, stop on by one of Plan Check Kitchen + Bar’s LA County locations for a burger with their signature KETCHUP LEATHER™. They make it by taking their homemade ketchup which they then dehydrate it and bake it. It tastes like ketchup and looks like a fruit roll-up, but as unorthodox as it sounds, it was created to prevent their buns from getting too soggy from the traditional condiment. Sound interesting? Try it on their Chef’s Favorite Burger. It’s a monster of an all-beef patty piled up with cheese two ways, bacon two ways, KETCHUP LEATHER™, and a yolky fried egg, then drizzled with hot sauce. If you’re in the mood for a tasty, no-frills burger and a chance to sample unique craft beers, The Wall is the place to go. The Wall features two burgers on their menu at all times: their Burger of the Month, and their staple, The Wall Cheeseburger. While The Wall Cheeseburger may be simple, it’s simple done right. This classic stack consists of a juicy, delectable all-beef patty that’s topped with American cheese and caramelized onions, then sandwiched between a freshly-baked bun. If you’re looking to switch up your burger routine, try going with a dish that brings an influence from Down Under. As a part of San Diego’s NZ Eats Family, Raglan Public House is known for using locally-sourced ingredients to bring New Zealand flavor to Southern California. And nothing supplies this better than the Lambalicious burger. It begins with an organic lamb patty that’s smothered with a three cheese spread and topped with wilted spinach, chipotle, caramelized onions all inside a delicious ciabatta roll. Located in Sofitel Los Angeles, Cattle & Claw is serving up menu items that are perfect for those who love land and sea. But forget the stuffy vibes of your typical surf and turf, Cattle & Claw is known for its gourmet burgers, succulent lobster dishes, and a laid-back atmosphere. If you want the best of both worlds, try ordering the Cattle & Claw #1. 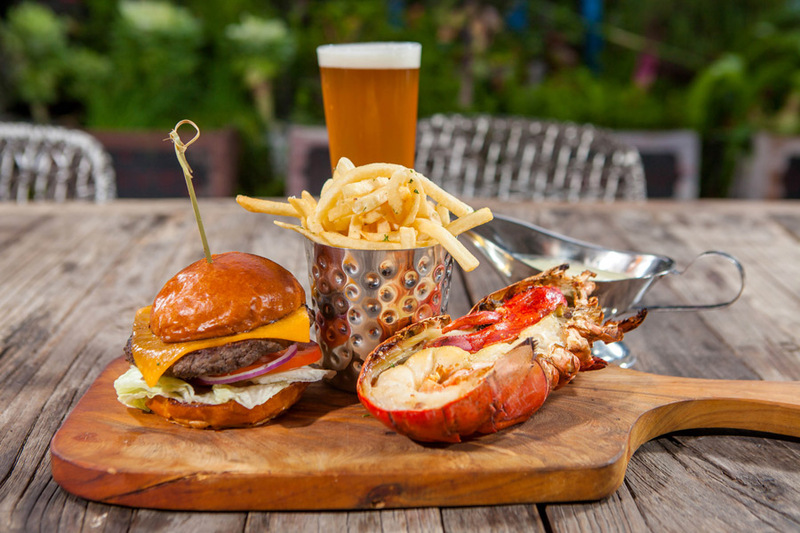 It’s a juicy, 5 oz burger served with half a lobster, a salad, and a side of fries. All that’s missing is one of the restaurant’s signature jar cocktails! If you’re craving Five Crowns flavor in a more casual, tavern-style atmosphere, try entering through the SideDoor. SideDoor shares a roof (and some menu items) with Five Crowns, making it the perfect mix of gourmet and go play. And if by any chance you can part ways with the prime rib, the SideDoor Burger is the way to go. There’s something so classic about the way the rich, fresh beef patty, the salty bacon, and the melty white cheddar mingle with the tangy sweetness of the Russian dressing and the red onion. Known for its casual atmosphere and one-of-a-kind burger creations, Jimmy’s Famous American Tavern has a burger for anyone and everyone. The star of this selection, though, would have to be The Jimmy Burger. Although it has tough competition from its fellow menu items, what sets The Jimmy Burger apart is a gooey blanket of pimento cheese, perfectly crisp Applewood-smoked bacon, and a pillowy bun slathered in jalapeno jam. It’s a well-known fact that Vaca is a carnivore’s paradise, but it might be a lesser-known fact that there’s a unique and mouth-watering burger hiding on their lunch menu. And in true Vaca fashion, this burger takes a truly unexpected twist while still celebrating each ingredient. The Hamburguesa offers a thick patty of prime burger topped with overnight tomatoes, crispy chorizo, and a smoked paprika aioli all between a fluffy brioche bun. It has all the kick and crunch you’ve been craving. Relaxing ambiance meets elegant flavors in this Escondido eatery. Bellamy’s Restaurant is a self-proclaimed hidden gem that specializes in providing its patrons with an at-ease atmosphere and farm-to-table ingredients. Among the delicious items on their lunch menu is Bellamy’s Burger. Bellamy’s Burger is a richly flavorful stack of a thick beef patty, arugula, bleu cheese, and caramelized onions that’s finished off with an aioli. The Mission of San Juan Capistrano has attracted visitors for hundreds of years, but lately it’s been the hub for a cornucopia of delicious and one-of-a-kind eateries. Among these is PUBlic 74, home of The Burger. Don’t let this Plain Jane name fool you, though. The Burger has a 10 oz patty of chargrilled wagyu beef that’s topped with white cheddar, greens, tomato, and pickled onions, then dressed with a splash of aioli. When you walk into Mr. G’s Bistro, you are greeted by the inviting aroma of traditional Italian flavors and the stylish comfort of a modern California eatery. Located on Balboa Island, Mr. G’s Bistro has been bringing the hospitality and the taste of Italy to Newport Beach since 2016. And on the menu, nestled between the fresh carbonara and the incredible New Zealand mussels, is the show-stopping Mr. G’s Bistro burger. 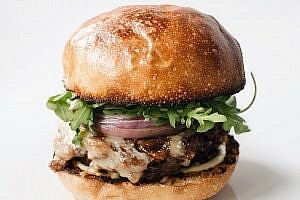 It’s a thick, house-ground patty made from short rib and chuck that’s topped with white cheddar, smoked bacon rum marmalade, red onion, arugula, and black pepper aioli.